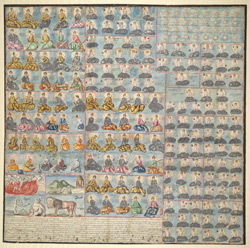 This is one of a set of delicate drawings depicting the world, the heavens and the hells of Buddhist cosomolgy. Here, various levels of incarnation are illustrated. The drawings were bound into an album presented to the India Office Library in 1849 by Lord Wynford, who probabaly acquired them from Henry Burnley. The close similarity of the small annotations in European handwriting on these drawings and those on another of Burney's manuscripts suggests the drawings may have been commissioned by Burney in 1830 when he was living in Burma.